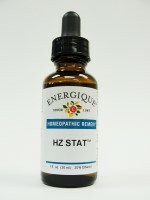 Energique's HZ Stat is a homeopathic remedy that supports the detoxification of Herpes simplex 1 & 2 and Herpes Zoster infections. It is beneficial for the temporary relief of aches and pains, febrile conditions, and painful skin lesions associated with Herpes infections. Hypericum perforatum 3x, Astragalus excapus 3x, Echinacea angustifolia 3x, Hydrastis canadensis 3x, Thuja occidentalis 12x, Dulcamara 12x, Nitricum acidum 12x, Ranunculus bulbosus 12x, Gelsemium sempervirens 12x and distilled water.